"A romance, you think? A legend? No, my friends, may Allah strike me dead if all I have told you is not true. Somewhere lost... stolen perhaps, hidden away, hangs that great golden bell." I wish I could say that this was a rollicking adventure in the truest tradition of Hollywood period epics. In the way that I remembered it from childhood, it was. But seeing it now is a great disappointment and there is very little to like about The Long Ships. The script is terrible, the action is mostly laughable and the performances are to a man (and woman), the worst of each actor's career, with the sole exception of Oscar Homolka as the Viking Thane, Krok. In The Long Ships, there is a legend about a great bell, called "The Mother of Voices," made of pure gold, three times the size of a man, made by monks many years ago and this is the story told in the marketplace by a Norseman called Rolfe (Richard Widmark), a man who has lost his ship and crew. The legend is silly, the pursuit of the bell by the main characters is silly... the whole darn thing is silly. Produced by Irving Allen, who followed this up with the 1965's almost equally bad Genghis Khan, which starred Stephen Boyd and Omar Sharif. Allen wisely left period epics and produced the Matt Helm series of films starring Dean Martin. He did, however, hit a career peak as a producer with the highly regarded epic, Cromwell, starring Richard Harris and Alec Guiness. 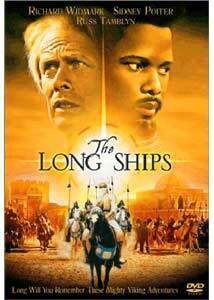 The Long Ships features a relatively rare directing turn by legendary cinematographer Jack Cardiff. He had won the Oscar® for 1947's Black Narcissus, and received two more nominations—one for 1956's War and Peace, and Fanny in 1962. Cardiff was also nominated for Best Director in 1960 for Sons and Lovers. Rolfe returns home from Africa to find that his father, Krok, is broke because the ship Rolfe lost represented all the money that was to pay tribute to the king; Krok is now forced to turn over a brand new ship as payment. Rolfe, determined to go back and find the bell, recruits the help of his brother, Orm (Russ Tamblyn), and together they steal the king's ship and head off in search of the giant golden bell. Even with the low points representing the production and direction, it is the acting here that takes this outing to new levels of poor film entertainment. For Sidney Poitier, The Long Ships has to rank as his worst performance on film with his mindless Aly Mansuh, throwing off one portentous platitude after another. One could almost imagine his urge to buy up the copies of the film, similar to the way Paul Newman wanted to keep film fans from seeing his turn as a Greek slave in The Silver Chalice. In the next few years, Poitier would create some of the most memorable characters in film with Lilies of the Field, To Sir with Love and In the Heat of the Night. The Long Ships, however, could easily have killed his career. Richard Widmark is terribly miscast. He is just too short and wiry to be believably of the Vikings. His habit of pausing before the significant word in each section of dialogue becomes truly annoying halfway into the movie, and one can't help but wait impatiently for him to add the second half of his lines. Widmark and Poitier appeared together in two other films to much greater effect, including No Way Out, by Joseph L. Mankiewicz, about racism, and The Bedford Incident, with Widmark as the captain of the American destroyer, USS Bedford, in relentless pursuit of a Soviet sub, pushing his crew to the breaking point, and with Poitier as a reporter. Russ Tamblyn's performance? Ugh. The budget must have been tight and rehearsals the first thing to be trimmed. The other characters are all just as stilted and uninteresting, refusing to bring to life the moribund screenplay. Rosanna Schiaffino as Aminah, wife to Aly, is straight from the worst of dubbed sword-and-sandal epics, and Bebe Loncar as the Viking princess Gerda is merely set dressing. On top of all this, the musical score is horrific in the worst Hollywood tradition; a few of the special effects are effective, if clumsy; and the battle scenes are not much better than what could be found in any "cast of thousands" period epic, if only there was a cast of thousands. In the end, The Long Ships is not really fit for anyone above the age of 12. I can't even recommend a rental because, let's face it... life is too short. Image Transfer Review: The video transfer is often quite murky, and this looks to be the source material at fault. How could a cinematographer like Cardiff shoot a film that looks so terrible? The Viking homeland, the shipboard scenes, and the Moorish city all look like the back lots they are. Those who like the film will certainly enjoy seeing it in its widescreen 2.20:1 glory as opposed to the terrible pan-and-scan found on television. Audio Transfer Review: The sound transfer is technically fine and unfortunately only brings to the front the terrible quality of the score. When you see them out on the ocean, turn it down! There is some occasional bits of nice separation in the Dolby Stereo processing. Extras Review: No extras. Mercifully so. To the cutout bin we go. Not quite what it seemed to be back in the day, The Long Ships is for specific viewing reasons only: Poitier completists, Widmark completists and cine-masochists. Otherwise, not even worth a rental because you can't get those two hours back.